He was a member of the 331 Infantry Regiment, 83rd Infantry Division. 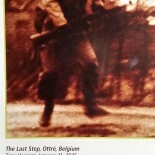 Jack W. Rose was most likely killed in the massacre of Ottré near Bihain, Belgium. 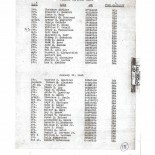 His name is mentioned in the document posted below. On January 10, 1945, two squads of Company F, 331st Regiment of the 83rd Infantry Division, attacked a German strongpoint, just outside the hamlet of Ottré. The two squads were ambushed and pinned down on the ground. Many soldiers were killed instantly. At about 23.00 hours, SS troopers were coming down the slope from the ridge and killed the wounded US soldiers. At least one man, Harry E. Shoemaker, survived the massacre. Photo by Tony Vaccaro on display at the East Tennessee History Center, Knoxville, TN. “Trapped by Time” WW II Vet now able to leave photo’s memory to history. By: Fred Brown, Knoxville News Sentinel, 15 August 2006. World War II ended for Tony Vaccaro five months ago. That’s when he officially located his buddy, Jack Rose. 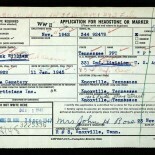 Rose then a 23-year-old Private First Class, died in action at a crossroads in Belgium 61 years ago. Vaccaro has never forgotten that scene. He couldn’t, because he is the one who took a photograph of his buddy’s dying moment, freezing it in time and in his memory. For the past six decades, the photograph Vaccaro 84, took of Rose trying to cross that road on Jan.11, 1945 in Ottre Belgium, has haunted him. He snapped the frame with his 35 mm camera at the exact instant Rose was hit with German rifle fire. He died instantly. Vaccaro, at the time an Army Private First Class as well, moved on with his outfit, Intelligence Platoon of the 2nd Battalion, 331st Regiment, 83rd Infantry “Ohio” Division. He did not discover until later what happened to Rose. He only new that he had been killed. “He was gone of course. When we came back through that area,” Vaccaro said. Plagued by the memory and with the photograph that became one of the most sought after in the world, Vaccaro sought after his buddy in European and American Memorial as well as private cemeteries. He even phoned all the Rose families he could locate. It wasn’t until this past March that he learned of the Knox County Archives and Eric Head, 42, archives assistant, who had been contacted by Dan Klare of Cincinnati (Ohio). Klare had phoned Vaccaro for information concerning missing soldiers he was trying to locate for WW II families. Klare wanted to know about possible photographs of missing-in-action soldiers who had never been found. That’s when Vaccaro told Klare about Jack Rose. 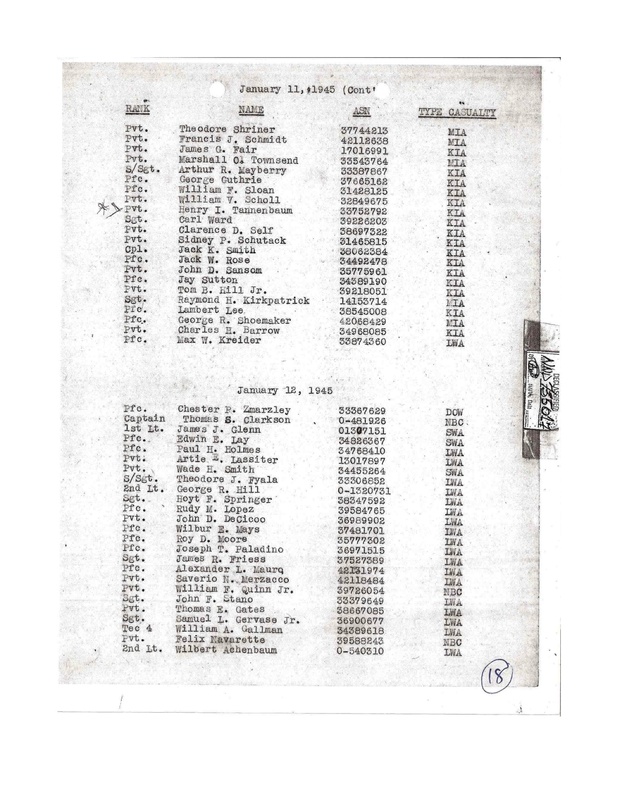 He thought no more about the conversation, he said, until he received a phone call from Klare telling him to contact the Knox County Archives, a part of the Knox County Library system. Vaccaro sent an e-mail to Head and learned that Jack Rose was buried in Mt. Olive Cemetery in Knox County and that Rose had a living brother, Bob, in Knoxville. “Then suddenly I felt an incredible relief,” says Vaccaro. “After 61 years, suddenly WW II came to an end. It was heavy to carry the memory of Jack Rose all these years. But I am so happy I will finally be meeting his brother. To me it is a revelation. Vaccaro, who went on to become one of WW II’s award-winning photographers, didn’t think anymore about meeting Rose until they were pinned down in Belgium. Vaccaro was not an official war photographer, but he had been given permission by his commanders to carry a camera, an Argus C-3 35mm, to document the action of the 83rd Infantry. In on quite a bit of action, Vaccaro’s photos are not sanitized, as were so many of the war photographs taken by the Army’s ‘official’ photographers. “My assignments,” he writes in his book “Entering Germany,” which covers 1944-49 and five years of German occupation, “usually with three other soldiers, was to go behind the enemy lines at night. We were to make contact with local inhabitants, gather information about enemy activity —- and return to headquarters with whatever they told us. “Like the other GIs, I carried a rifle in my hands. But what set me apart was the Argus C-3 35mm hanging around my neck— always ready for the next shot. By the end of the war, I had taken nearly 7,000 photographs.” Working with an intelligence unit, which put him on night patrols, he was able to use his days to take photos and to process his negatives. His darkroom consisted of blankets, four helmets and tree branches from which to hang his negatives to dry. 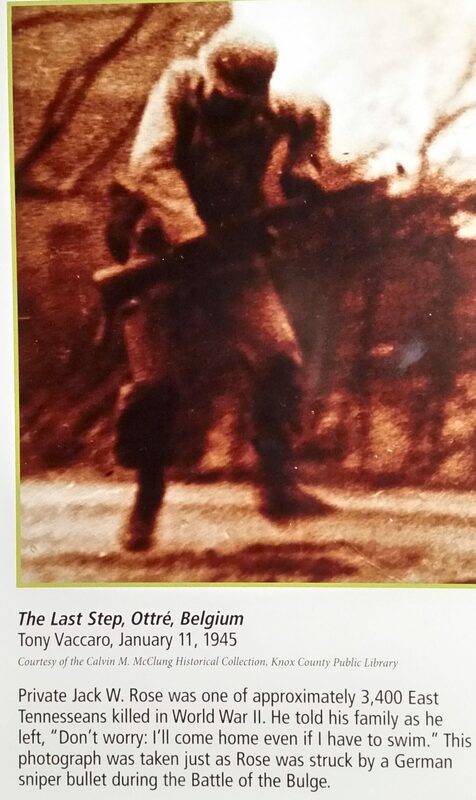 Vaccaro, in fact, took one of the war’s most famous shots: that of Jack Rose, the moment he was killed in Belgium. That is why he has wanted find his buddy all these years: to put to rest the memory and to put flowers on his grave. On Aug.28, he and Rose’s only living brother, Bob Rose of Knoxville, will attend a ceremony at Mt. Olive Cemetery and together put flowers on the tombstone, closing the chapter for Vaccaro. Vaccaro says he hopes to bring other soldiers from the 83rd’s annual reunion which is being held in Nashville Ind., and ends Aug 27. Vaccaro had his baptismal combat in Normandy before entering Germany in December 1944. He remained in Germany through the end of World War II and then got a job with the U.S. State Department at the Audio Visual Aids section based near Frankfurt. He beat out 20 other photographers for the job with his war photos, especially the one of Jack Rose, and another he shot of Pvt. Henry Irving Tannenbaum, who was killed in the bitter near Ottre. The shot of Tannenbaum shows the soldier lying face down in the snow. One year after the end of the war Vaccaro was able to purchase a Jeep and a new camera. He says he spent the next seven months roaming the German countryside, shooting people, places, valleys, castle and lakes. He was interested in showing how Germany, on its knees industrially and economically was coping. He especially wanted to express how the war had affected Germany’s children. Soon Vaccaro attracted the attention of Weekend, a picture magazine and Sunday supplement for the Military’s Stars and Stripes, based in Phungstadt Germany. He called those his golden years in photography in Germany, which lasted until 1949. He photographed a variety of subjects and was published every week. Once back home, Vaccaro landed jobs shooting for LIFE and LOOK and in the 1950s became chief photographer for Flair Magazine. Vaccaro said that all through his life he has been on the search for Jack Rose. “I wanted to tell his family what happened to him,” Vaccaro said. “Back then, nothing was done for families. They just received a telegram saying, ‘Your son was killed.’ There was no help. It was just awful. Vaccaro pauses to take a breath. “Jack Rose was such a wonderful man, and a sweet man. 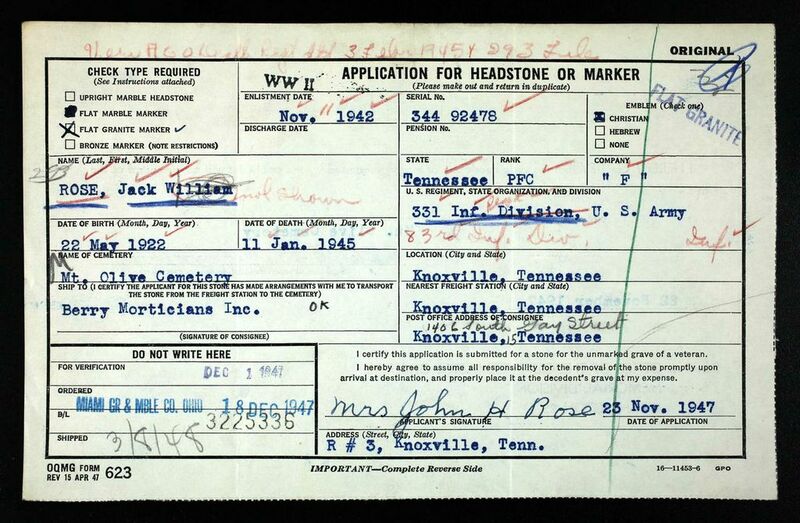 He was born just six month before me, in the same year.” And now that he has found where jack Rose was buried. The World War II soldier/photographer can let his war return to history.